Right out of the gate, Roachblunt's debut EP shows the listener the band's penchant for chaos and noise, as well showcasing nearly every member's talents simultaneously. 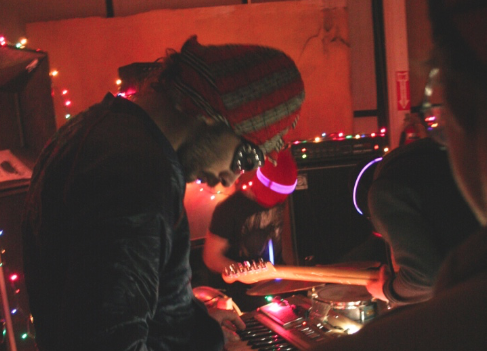 Roachblunt has members from local skramz groups and is often placed on shows with them; the band takes the genre as a base, then adds as much mathy jamming and weirdness as they can fit in. In addition to amounts math that would make a statistician's head spin, Roachblunt differs from its counterparts in the fact that the vocals (handled by Elisa Cox) are sung and not screamed. The band's live performances are also just as spectacular as the recordings, often featuring strange costumes and holiday lights to supplement the crazed, colorful noise created by these Kansas Citians. You can listen to their EP below and purchase it on tape from Puddlejumper Distro. They will be playing a release show at The Chum Bucket house on March 5th at 8pm, as well as a show at The Blind Tiger on March 20th.